As a member of the International Dance Council you are invited to attend the 22nd General Assembly to be held on Sunday 17 December 2017 at the Old Parliament in Athens. CID does not provide financial assistance for travel or accommodation. You can apply to your country’s National Commission for UNESCO and to public or private sponsors, on the basis of this invitation. Only CID members can attend the General Assembly. Members unable to attend can send a proxy for another member. Working languages are English and French, without translation. For further information please visit http://Faliro.Section.cid-world.org or contact the CID Secretariat. 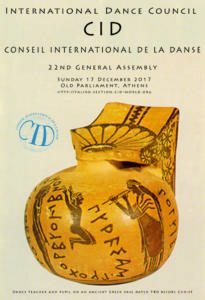 En tant que membre du Conseil International de la Danse, vous êtes convoqué/e à la 22ème Assemblée Générale, qui se tiendra le dimanche 17 décembre 2017 dans le Palais de l’Ancien Parlement à Athènes. Le CID ne pouvant pas prendre en charge les frais de voyage ou d’hébergement, vous pouvez faire une demande auprès de la Commission Nationale pour l’UNESCO de votre pays ou bien auprès d’organismes publics ou privés, sur la base de cette invitation. La présente convocation peut être utilisée pour soutenir votre demande de visa auprès des autorités consulaires, si nécessaire. Pour des renseignements complémentaires veuillez visiter http://Faliro.Section.cid-world.org ou contacter le Secrétariat du CID. Monday 17 December 2017 at 09:30 in the Old Parliament House, Stadiou Street, Athens, one block from Syntagma Square, right in the city center. 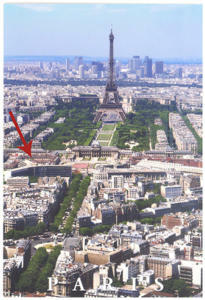 Be there at 09:00 for accreditation. Passport is required. Make sure your name is in the List of Participants, check the Congress website. The General Assembly is an administrative event, there are no lectures, performances or dance classes. Very limited time will be available for speakers, strictly up to 3 minutes to present views on policy. The Assembly will last several hours, it will end before 17:00. Read the agenda at the Congress website. 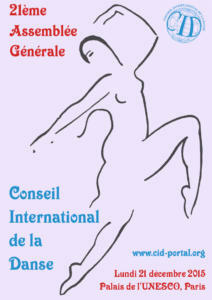 English and French are the working languages of CID, either one can be used. If you are in the List of Speakers you can use any other language. Translation will not be provided. We would like you to meet every Member in the Assembly, discuss cooperation with them at informal meetings. Bring a large number of visiting cards to exchange (see format at the CID Portal). Bring flyers and printed matter to distribute. 200 members from 30 countries are expected. Book a hotel preferably in Plaka or nearby. We can suggest low-priced accommodation. 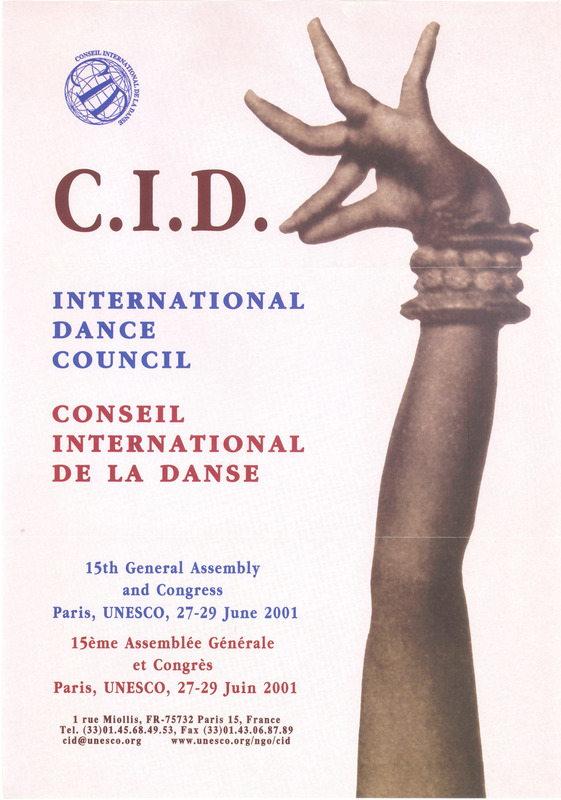 CID Members from Athens will be happy to give you information; ask them for places of particular interest to dance professionals. You can pay a visit to the Embassy of your country, call them before for an appointment. International Certification will be awarded at a special ceremony to students attending the General Assembly. Fill the Certification form for your students. It is highly recommended to meet other members at meetings on Saturday, Sunday and other days. Please wear your CID insignia and carry the CID bag. Call the Consulate of Greece to get information on documents and time required for a visa. Ask for Certificate of Invitation to be sent to you together with Confirmation of Membership 2017 & 2018. You will find information on visa at the Assembly website. Only Members of the CID for 2017 or 2018 can take part. A List of Members attending will be at the entrance. Send membership fee for 2018 as early as possible, our Secretariat will be very busy. If you have colleagues who wish to attend please nominate them now (send their name and email address). Take a few days before or after the Assembly to enjoy Athens. Most museums and archeological sites are at walking distance from the city center. Wearing an ethnic dress or parts of it at the Assembly is most welcome. Wear the CID insignia and carry a CID bag.